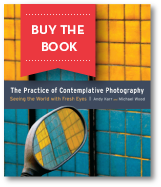 The Practice of Contemplative Photography has been many years in the making. The authors started working on the book about four years ago. But you could say, Michael Wood began working on this practice thirty years ago. In fact, if you trace it all the way back, you will find that this all began when Chögyam Trungpa Rinpoche got his first camera in Tibet in the 1950s.